The ceremony was mostly attended by family and was held in one of the lovely rooms in the ground floor. 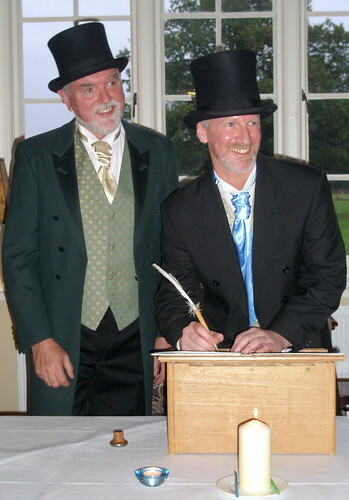 John and Andrew made a grand entrance dressed in top hats and tails, carrying canes and wearing cravats. Very nice! The registrar and her assistant made a good job of the ceremony: Andrew and John exchanged neck chains, and lit a unity candle. John’s daughter, Louise, was one of the witnesses and Michael did a good job of looking after one of her sons, Rory. 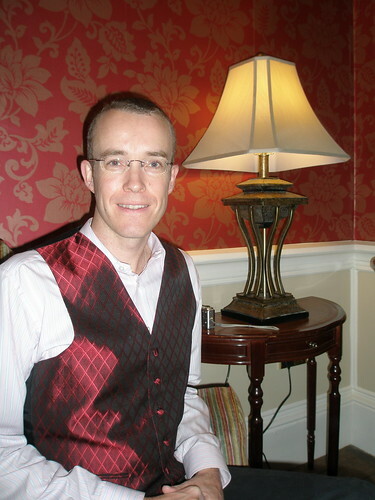 Michael looked great in his red waistcoat, and it was very romantic to be there with him, remembering our own civil partnership 18 months ago. After the ceremony we had Bucks Fizz and some photo opportunities. Some of the photo’s are on my Flickr set. We had a relaxing and very nice buffet meal in the conservatory at the side of the building, including some wicked mini eclairs with a dark chocolate dipping sauce, then spent the evening chatting in the front drawing room. About 11pm, Michael and I ventured out for a stroll and some fresh air, but the weather was so damp and windy that we only lasted 5 minutes before slinking back inside. The rooms at Offley Place are lovely, I particularly liked the stylish bathrooms (so I took loads of photos’ for inspiration for our bathroom at home). We were woken up at 2.30 in the morning by two of the waitresses who wanted to borrow our key to see if they could get into one of the other rooms! A Very strange thing to happen and quite annoying at that time in the morning. It also disturbed Andrew’s sister and family who were in the room opposite. We mentioned it to the Manger when we checked out and he was speechless. We joined Andrew and John, and Andrews family for breakfast in the morning, after a leisurely lie in bed, an extra hour because of the clocks changing! 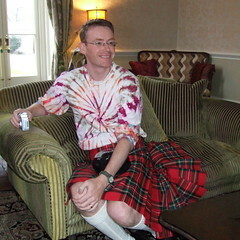 This entry was posted in At home, Civil partnership by Graham. Bookmark the permalink.